Still looking for the ultimate Sport Horse? Have the "Sport Horses" you've gone to see live up to their hype? For great athleticism, sound conformation, a willing mind, and show stopping good looks, buy a top quality Sport Horse from Karen Griffith Farms. The Pinto / Paint colorings are just the icing on the cake! Young Athletic Paints of This Height and Ability are Hard to Find! Jumper / Eventing Prospect Deluxe! Do you need versatility? This is your boy! He's ranched raised and has even worked cattle. Do you want to do the jumpers? 4' will be a breeze! Do you want to ride a horse with class? Do you want to find a sport horse with talent and fancy color? Here he is! 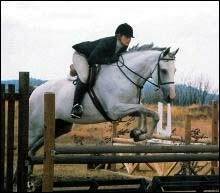 Roca El Mundo has won numerous Championships in both Montana and California in the 3'3" and 3'6" Hunter and Jumper classes. (He stood MJHA Year End Reserve Champion, 3'3'' Hunters.) Mundo has been schooled on the Event Course and loves his work. Mundo stands 16.1 plus hands, is athletic and very classy. He likes people and is very nice, but sensitive - more TB in temperament. He is probably best suited for an upper level intermediate to an advanced rider. Mundo was ranch raised and gained much of his experience on trails and in the mountains of Montana. He handles varied terrain easily. Mundo has the ability to excel in upper level eventing, hunters, and jumpers. This is a consignment horse. Check Out This Fabulous Mover! "Becky" is a fabulous mover! She exhibits outstanding talent for Dressage, Hunter, or Western Performance and has free jumped up to 3'6". She is currently at 15.2H with more maturing to go. She has lots of bone, great hooves, big hocks, deep heartgirth, and a broad chest. This mare shows her Thoroughbred breeding. She is started under saddle and is going well. Her pedigree contains many of the "greats"! Luke has a great personality and disposition. He handles new situations without a problem, adapts well to about anything. He has been started on trails and ridden both English and Western. He has been trailered to an indoor arena and accepted both the trailering and exposure to the indoor environment without hesitation. Luke stands 15.3 hands. He has the potential for eventing, pleasure and dressage, as well as for being a youth horse. Luke's sire is taking Championships in 3' hunters. Perfect for The Junior Hunters - Loves Kids! Congratulations to Elaine Coller and Miracle Round for winning the Montana Hunter Jumper Association year-end 3' Pre-green Hunter Championship. Miracle Round will be featured in The Chronicle of the Horse Miracle Round is a Montana ranch-raised daughter of Spectacular Round, a 17-hand grey son of Kentucky Derby and Preakness winner Spectacular Bid. 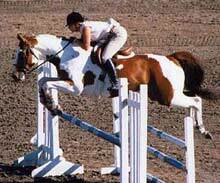 (Spectacular Round was a leading Hunter Jumper sire in Northern Calif. until his death). Miracle Round excels at eventing, hunter, jumper, and dressage and has been schooled to 3'6''. She has been shown often in both Montana and California, winning numerous championships. She LOVES kids of all ages (see photos of her with 4 year old Chelsie). Excellent horse for adult or junior rider. PHANTOM LOVE - 1996 solid dark steel gray mare. This 3/4 Thoroughbred mare has a wonderful disposition, correct conformation, and fluid movement.15-3 hands. She is superbly bred for speed (extended pedigree available), but has the mind and movement to be an outstanding show mare. For an affordable "A" circuit hunter prospect, or a mare with the level mind to bring along for the speed events, this lovely girl should be a top consideration. By "Phantom Heart" (APHA), out of "Love of Success" (TB). $3,500. Breed your sport horse mare to one of the outstanding Karen Griffith Farms' stallions listed below and make it happen! K G RAVEN HEART - 1995 APHA jet black and white tobiano stallion. By "Ebony Heart" (APHA full brother to American Horse Show Association Hunter Champion, "Bedazzle"), and out of "Steal My Heart" (APHA homozygous tobiano "Atahi" daughter). "Raven" is line-bred "Atahi" and it shows! He is the stallion we've been awaiting to fill Atahi's shoes. A Pinto Sport Horse breeder's dream! This outstanding boy has perfect legs with plenty of bone and great feet. He has a gorgeous head with a star, stripe, and snip, large dark "Atahi" eyes, and a very refined neck. (Raven has the most elegant neck on a mature stallion that you've ever seen.) His topline is strong, tying into a beautiful hip, and he has a wonderful slope to his shoulder. "Raven's" movement is fluid and reaching. His markings are 60/40 (black/white), and are beautifully placed. He is a lovely sight under saddle. A recent customer, who was stunned by his beauty, described him simply as "A work of art!" "Raven Heart" is smart, athletic, and classy! Being line-bred "Atahi", he should stamp his get with these same exceptional qualities. He's the "do-it-all" kind of horse that "makes a living" for the people around him. "K G Raven Heart's" book will be limited to 20 outside mares. Introductory breeding fee $750. NEWS FLASH!!! .....All of Raven's foals to date have been loud tobianos out of solid mares. If Raven's future foals are half as good as these, his offspring are going to be the Paints to beat in the new millennium!! "Braveheart" is line-bred "Atahi", and should mark his get with all of the outstanding traits Karen Griffith Farms has been working to achieve over the last thirty years. Make a name for yourself in the show ring and breeding world that others spend a lifetime attaining! Introductory breeding fee $500. ATAHI II - 1999 APHA jet black and white tobiano stallion. You can tell by his name how this spectacular young stallion has been evaluated! "Atahi II" is Big, Black, and Beautiful! 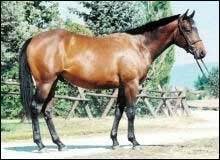 For twenty-six years the name "Atahi" had belonged to one horse only! I've added a 'II' after the name to describe just how perfect this stud is! He is 70% black and 30% white. His markings are fantastic, and his conformation is faultless! He has an exceptionally sweet, willing disposition. He is a double grandson of "Atahi". "Atahi II" is the best balanced, highest quality black and white stallion (tobiano or overo) of his age that I've ever seen. I feel he will produce the next (fifth) generation of successful, sound, beautiful, Paint horses at Karen Griffith Farms. He is by "Ebony Heart" (APHA black stallion-outstanding own son of "Atahi", AHSA Champion Sire), out of "Win My Heart" (APHA dark bay and white, homozygous, tobiano mare-one of "Atahi's" best daughters). Keep in mind that the great horses like Leo, Wimpy, etc., etc., were produced by this half brother, half sister mating of prepotent, genetically correct sires. I waited 20 years to line breed "Atahi" offspring. I wish I had begun sooner, but I'm old fashioned, and wanted to breed to a large variety of mares to make sure there were no 'fluke' genes there to crop up. You've probably heard the old saying....."You could breed that horse to a hay wagon and make a race horse! " Well, "Atahi" has proven to be one of those genetically superior stallions. With "Atahi II's superb genetics, absolutely flawless conformation, willing disposition, and beautiful coloring, he should stamp his offspring with all of the outstanding qualities that Karen Griffith Farms has worked so diligently to achieve over the last 30 years. Introductory breeding fee $750.